As the mullahs grapple with the wave of protests that has engulfed Iran and threatened to topple their tyrannical regime, the Iranian opposition is busy making arrangements for their annual conference that will take place at the end of the month. On June 30th, People’s Mujahedin Organisation of Iran (MEK) and National Council of Resistance of Iran (NCRI) supporters will gather in Paris. 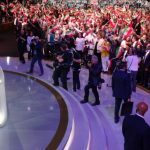 It is one of the most significant events of the year for the Iranian opposition movement, bringing together opposition supporters from across the globe. There are signs that the gathering is worrying the clerical regime. The regime’s Foreign Ministry Spokesman told the national press that Rouhani held talks with the French government in an attempt to get them to cancel the event. The spokesman, Bahram Ghasemi threatened France, stating “those who give a permit to such gatherings are wrong”, ominously adding, “they themselves will be affected by the consequences as well”. Ghasemi was not alone in his criticism of the French government. Regime’s National Security Commission Spokesman, Naghavi Hosseini also condemned the French decision to allow the gathering to go ahead. He suggested it was a policy which would put the French government in confrontation with the Iranian regime. Hosseini added, “the MEK is going to harm Iran-European relationships”. Hosseini said that Iran would have to re-evaluate its European policy should the gathering go ahead. The Parliamentary Research Centre and the Iran-Europe Parliamentary Relationships Group have also written letters to their French counterparts that indicate their fear of Iran opposition’s activities even outside Iran. The letters warn the French authorities of the NCRI’s “hostile moves in France”. They also express anger at the European Union’s decision to remove the MEK from its terror list in 2009. The chairman of the regime’s Parliamentary Research Centre, Kazem Jalali, accused the MEK of creating a “rift” between France and Iran. His comments were echoed by Mohammadjavad Larijani, the regime’s judiciary International Deputy. 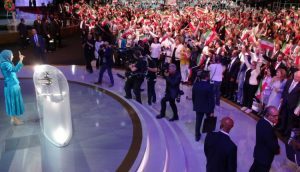 He told a State TV program that the regime had expressed its disapproval to the Europeans over their permission of other recent NCRI and MEK events. He also questioned the role the US would have in the gathering. The comments are one of the strongest indications yet that the MEK’s activities pose a real threat to the existence of the mullahs’ regime. With the parliament, the judiciary, and senior officials of the regime all speaking out against the Paris gathering, the mullahs evidently feel threatened by increasing domestic and international support for the opposition movement. They are right to fear the protest. It will inspire domestic demonstrations across Iran as the Iranian public see that the international community is ready to support them. The NCRI’s status as a democratic alternative to the mullahs’ regime will receive international attention, as will the NCRI’s President-elect, Maryam Rajavi. The Grand Gathering in Paris will add to the growing chorus of voices calling for regime change in Iran. The mullahs should be nervous. Their days are numbered.